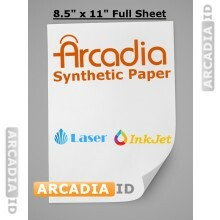 Arcadia synthetic paper offers an alternative choice to Teslin and Artisyn paper for printing high quality IDs and other important documents. Arcadia is a synthetic paper that is waterproof, tear resistant, and essentially weather proof as it will not be damaged in any type of weather that it is in. Arcadia paper is the perfect choice for making ID cards because it is much cheaper than Artisyn paper and it is a higher quality than Teslin paper, both of which are often used in the ID making process. 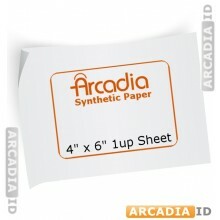 Arcadia synthetic paper is currently sold in either a full or perforated 8.5 inch by 11 inch sheet or in a 4 inch by 6 inch sheet known as a 1-up sheet. Special orders of different sizes and thicknesses can be completed through your order. The paper can be used with either a laser or an inkjet printer, which makes it extremely durable. What Can You Make with Arcadia Paper? 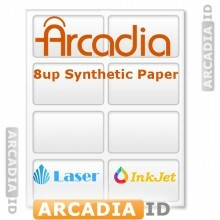 There are a number of different applications that Arcadia paper can be used for. This durable synthetic paper can be used to print high quality ID cards, menus, brochures, flyers, and much more. You can easily use IDcreator.com or another template available in either Word format or in Adobe Photoshop format in order to create your badge. Once you have created the badge, you can print it out using your home or office printer. If the paper is perforated you can punch out your cards and they are ready to laminate using a butterfly pouch. You can then laminate the cards using a laminator. In just a few short steps you will have created a professional looking ID card on Arcadia paper for a much lower cost.